Sterling silver liquor set which is a staggering pièce de résistance. Handcrafted entirely out of sterling silver, featuring glittering amethysts throughout and intricate decorations which twist and weave in an effortless fashion to complete the beauty of this set. 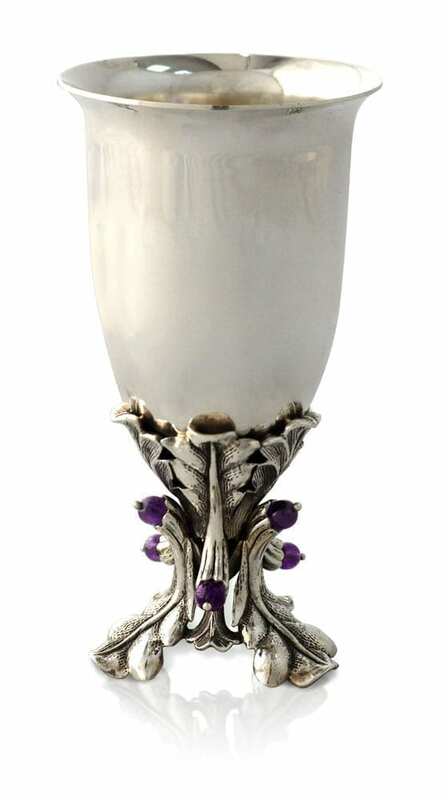 Contains a large Kiddush cup and 7 mini liquor cups, all in an elegant, smooth design with silver leaves, embellished with round amethysts, climbing up the bottom and snaking up the cups to create a glorious base. Set upon a brushed silver tray, accented with shining silver vines and amethysts along its rim. Used alone, each cup is a masterpiece, and when used together it truly shines and comes together as a triumphant set. Set up in a variety of ways to suit your style and give a unique twist to each occasion. Brushed silver tray may be wiped with a wet cloth and patted dry. Do not wash with soap.